The AEC Routemaster bus must be one of the most recognisable icons in the world. Although development began in the late 1940’s it was not until 1954 that the first prototype, RM1 (SLT 56) was revealed to the public at the Commercial Motor Show at Earls Court on 24th September 1954. After extensive trials it entered public service on the 8th February 1956 from Cricklewood Garage. Three further prototypes followed, before production commenced. A total of 2,876 Routemasters were built, numerically the last Routemaster built for London Transport was RML2760 (SMK 760F) in early 1968. So, 60 years on a celebration was held at Finsbury Park in north London over the weekend of the 12th and 13th July 2014. The independent transport videos cameras were on hand to record the event on both days. Filming starts early on Saturday morning as we record some of the Routemasters that stayed overnight as well as a good number of Routemasters arriving to form the main display. There is plenty of action for you to see as the buses take up their places. Notable arrivals are obviously the star of the show, RM1 (SLT 56), green RM2 (SLT 57) which has recently been restored to its original condition proudly displaying its original style bonnet and radiator grill, and Leyland engined RML3 (SLT 58). We also see the one and only rear engined Routemaster, FRM1 (KGY 4D). Other historic buses in attendance includes ‘B’ type B2737 (LH 8186) and DLA1 (R101 GNW) in Arriva training bus livery, being the first low floor bus in London, an Alexander ALX400 bodied DAF. Our cameras now move out of the park to Seven Sisters Road to sample two rides by Routemaster on free service X60, the first on RML2344 (CUV 344C) and the second on board RCL2226 (CUV 226C). These rides complete our filming of the first day. Sunday morning filming commences early as the Routemasters arrive to take up their positions. Even more examples arrive together with historic buses in the shape of STL2377 (EGO 426), RT113 (FXT 288), RT2177 (KGU 106), L2 (A102 SYE) and ‘New Routemaster’ LT60 (LTZ 1060). At midday we recorded the ‘Buses from the Decades Parade’, and later in the day the ‘Parade of significant Routemasters’, all from different locations. In all, a comprehensive record of the day for you to enjoy. 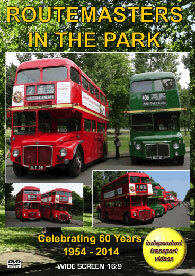 Our thanks must also go to the Routemaster Association for putting on this excellent event. Duration : 76 minutes (approx).